A lovely lemony breakfast treat for mum. put everything in a small saucepan and bring to the boil. Boil over a medium heat until the liquid has reduced by half. Heat a little of the butter in a nonstick saucepan. Dunk 2 slices of bread into the eggy mix and let them sit for a minute, before turning the bread over, so it soaks up lots of the liquid. Cook the bread over the gently sizzling butter for 3-4 minutes on either side. 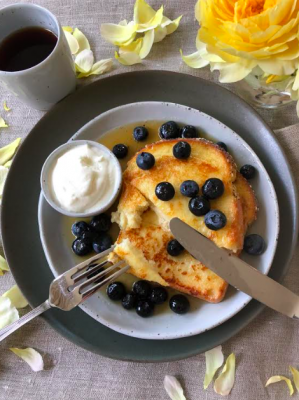 To serve, place 2 slices of french toast on a plate, pour over a generous amount of honey lemon syrup and a good scattering of blueberries. The blueberries can also be tossed in the hot syrup to serve. You could serve the French Toast with plain greek yoghurt, cream, or ricotta.